High quality complete beef feeds for cattle on pasture or feedlots and designed to complement a variety of forages. Feed at a rate of 2% of body weight per head per day. Formulated with Hydrochloride trace minerals, biotin and all essential vitamins required for optimal performance. High quality complete beef feed for cattle on pasture or feedlots and designed to complement a variety of forages. Feed at a rate of 2% of body weight per head per day. Formulated with Hydrochloride trace minerals, biotin and all essential vitamins required for optimal performance. An economical commercial beef feed formulated for those on ample pasture or good quality hay. Supplemented with vitamins and trace minerals to provide nutritional balance for the well-conditioned animal. A complete birth to market feeding program where each stage of feeding is designed to improve gains. All natural protein pellets designed to be mixed with grain on farm to make creep feed, grower feed and finishing rations. Free Choice mineral fed to compliment farm based nutritional and grazing programs. A highly digestible calf creep feed designed to help wean calves. Fortified with Neotec4® to stimulate pancreatic development and fortified with Celmanex® and Rumensin to aid digestion and prevent coccidiosis. Available as a texturized and pelleted feed. Complete pelleted starter pellet fortified with Rumensin. A well balanced textured creep feed designed for increased weight gain and fortified with Rumensin for the prevention of coccidiosis. Formulated with quality ingredients with pelletized minerals and protein to prevent sorting in calves that are starting to consume forage. Ideal for pre-ruminant heifers and steers and fortified with Rumensin. Designed for heifers transitioning onto forage diets. Feed starting at 4 pounds per head per day in decreasing amounts as heifers age, condition of animal dictates and forage quality allows. Fortified with Rumensin. A 12% complete balanced creep feed containing cracked grains for better digestibility in calves. A 13% textured, high fiber complete feed for growing cattle to achieve muscle growth and frame while maintaining bloom. Feed at the rate of 2.5% of body weight along with good quality roughage. A 12% textured, high fat, high fiber finishing feed. 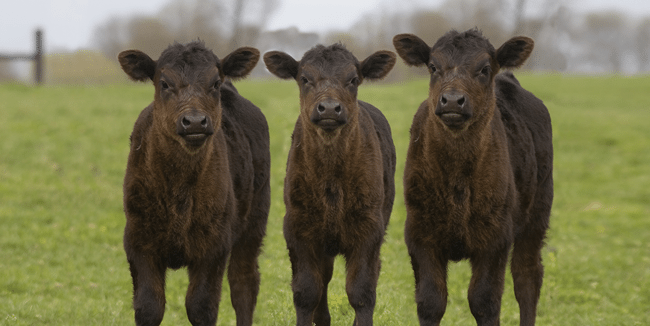 A complete starter pellet formulated for beef calves. Designed for conditioning show/sale calves, weaned calves and receiving feeder calves. The 27% fiber level makes it an ideal product to use on show steers or heifers for fill when body and rib shape is needed. A highly fortified, 13% complete, textured feed that is medicated with Rumensin. Contains a flavoring agent to help drive appetite and consumption as well as probiotics to optimize growth and performance. Feed at a rate of 2-2.5% of body weight per day along with good quality hay. A well balanced 12% complete, textured, high fat, high fiber finishing feed with added barley to help achieve the desirable “smooth” handle. Medicated with Rumensin and fortified with a flavoring agent for palatability as well as probiotics to optimize growth and performance. Feed at a rate of 2-2.5% of body weight per day along with good quality hay. Grain products, plant protein products, processed grain by-products, calcium carbonate, molasses products, blended poultry and vegetable fat preserved with BHA, sodium bentonite, monocalcium phosphate, dicalcium phosphate, salt, Vitamin E Supplement, Zinc Hydroxychloride, Manganese Hydroxychloride, Mineral Oil, Copper Hyrodoxychoride, Vitamin A Supplement, Vitamin D Supplement, Cobalt Carbonate, Calcium Iodate, Biotin, magnesium oxide, propionic acid, acetic acid, ammonium hydroxide, vermiculite, calcium bentonite, tallow, selenium yeast (Saccharomyces cerevisiae), roughage products, sodium selenite. Feed at a rate of 1% up to 3% of the body weight of the animal. Always provide clean, fresh water at all times along with good quality forage. Ggrain products, plant protein products, processed grain by-products, calcium carbonate, molasses products, blended poultry and vegetable fat preserved with BHA, sodium bentonite, monocalcium phosphate, dicalcium phosphate, salt, magnesium oxide, Vitamin E Supplement, Zinc chloride, roughage products, Manganese chloride, Copper choride, Vitamin A Supplement, Vitamin D Supplement, mineral oil, d-Biotin, Cobalt Carbonate, ethylenediamine dihydriodide, calcium propionate, selenium yeast (Saccharomyces cerevisiae), magnesium sulfate, potassium sulfate, choline chloride, L-lysine, ferrous sulfate, zinc sulfate, zinc oxide, manganese sulfate, copper sulfate, manganese oxide, calcium iodate, vitamin B supplement, riboflavin, niacin supplement, calcium pantothenate, menadione dimethylprimidnol bisufite, follic acid, biotin, thiamine mononitrate, pyridoxine hydrochloride, dried aspergillus oryzae fermentation product, dried yeast fermentation solubles, organic selenium. Grain products, plant protein products, molasses products, monocalcium phosphate, dicalcium phosphate, calcium carbonate, salt, Processed Grain By-Products, Vitamin E Supplement, Zinc Hydroxychloride, Manganese Hydroxychloride, Mineral Oil, Copper Hyrodoxychoride, Vitamin A Supplement, Vitamin D Supplement, Cobalt Carbonate, Calcium Iodate, Biotin, magnesium oxide, propionic acid, acetic acid, ammonium hydroxide, vermiculite, sodium bentonite, calcium bentonite, tallow, selenium yeast (Saccharomyces cerevisiae), roughage products, sodium selenite. Processed grain by-products, plant protein products, animal protein products, calcium carbonate, urea, sodium bicarbonate, sodium bentonite, potassium chloride, salt, magnesium sulfate, potassium sulfate, zinc sulfate, manganese sulfate, copper sulfate, copper chloride, ferrous chloride, ethylenediamine dichloride, cobalt carbonate, sodium selenite, vitamim A acetate, vitamim D supplement, vitamim E supplement. Each Pound of Premium Dairy Beef Grower R170 contains 85 mlg of Monensin. Thoroughly mix 353 pounds of Premium Dairy Beef Grower R170 per ton with whole dry shelled corn to provide 30g of Monensin. Feed continuously at the rate of 18.0lbs per head of the toatally mixed ration to provide 229.5mlg of Monensin per head per day. Always provide fresh, clean water. Do not allow horses or other equines access to formulations containing Monensin. Ingestation of Monensin by equines has been fatal. Monensin medicated cattle feed is safe to use in cattle only. Consumptionby unnaproved species may result in toxic reactions. Do not exceed the levels of MOnensin recommended in the feeding directions, as reduced average daily gains may result. Feeding undiluted or mixing errors resulting in high concentrations of Monensin could be fatal to cattle. Must be thoroughly mixed in feeds before use; do not feed undiluted. If feed refusals containing Monensin are fed to other groups of cattle, the concentration of Monensin in the refusals and the amount of refusals fed should be taken into consideration to prevent Monensin overdosing. Processed grain by-products, plant protein products, animal protein products, calcium carbonate, urea, potassium chloride, salt, sodium sesquicarbonate, sodium bentonite, magnesium sulfate, potassium sulfate, zinc sulfate, manganese sulfate, copper sulfate, copper chloride, ferrous sulfate, ethylenediamine dichloride, cobalt carbonate, sodium selenite, vitamim A acetate, vitamim D supplement, vitamim E supplement. Plant protein products, processed grain by-products, calcium carbonate, animal protein products, sodium bentonite, natural flavors, artifical flavors, monocalcium phosphate, dicalcium phosphate, salt, urea, kaolin, magnesium oxide, molasses products, Vitamin E Supplement, Zinc chloride, roughage products, Manganese chloride, Copper choride, Vitamin A Supplement, Vitamin D Supplement, mineral oil, d-Biotin, Cobalt Carbonate, ethylenediamine dihydriodide, selenium yeast (Saccharomyces cerevisiae), sodium carboxymethyl-cellulose, corn distillers dried grains with solubles, dextrose, sucrose, calcium silicate, artificail flavor ingredients, propylene glycol, magnesium sulfate, potassium sulfate, choline chloride, L-lysine, ferrous sulfate, zinc sulfate, zinc oxide, manganese sulfate, copper sulfate, manganese oxide, calcium iodate, vitamin B supplement, riboflavin, niacin supplement, calcium pantothenate, menadione dimethylprimidnol bisufite, follic acid, biotin, thiamine mononitrate, pyridoxine hydrochloride, dried aspergillus oryzae fermentation product, dried yeast fermentation solubles, organic selenium. Monocalcium phosphate, dicalcium phosphate, calcium carbonate, salt, Processed Grain By-Products, Vitamin E Supplement, Zinc Hydroxychloride, Manganese Hydroxychloride, Mineral Oil, Copper Hyrodoxychoride, Vitamin A Supplement, Vitamin D Supplement, Cobalt Carbonate, Calcium Iodate, Biotin, sodium selenite, magnesium oxide, soybean oil, artificial flavors, artifical flavors. Feed free choice to beef animals. Always provide clean fresh water at all times. Magnesium oxide, monocalcium phosphate, dicalcium phosphate, Processed Grain By-Products, Calcium Carbonate, Vitamin E Supplement, Zinc Hydroxychloride, Manganese Hydroxychloride, Mineral Oil, Copper Hyrodoxychoride, Vitamin A Supplement, Vitamin D Supplement, Cobalt Carbonate, Calcium Iodate, Biotin, salt, sodium selenite, soybean oil, artificial flavors, artifical flavors. Calcium carbonate, processed grain by-products, potassium chloride, salt, monocalcium phosphate, dicalcium phosphate, Vitamin E Supplement, Zinc Hydroxychloride, Manganese Hydroxychloride, Mineral Oil, Copper Hyrodoxychoride, Vitamin A Supplement, Vitamin D Supplement, Cobalt Carbonate, Calcium Iodate, Biotin, potassium sulfate, magnesium sulfate, magnesium oxide, sodium selenite, tallow, vitamin A acetate, dl-alpha-tocopherly acetate, silicon dioxide. Processed grain by-products, plant protein products, roughage products, grain products, molasses products, forage products, calcium carbonate, pork fat (preserved with BHA), sodium bentonite, salt, sodium sesquicarbonate, lignin sulfonate, calcium bentonite, vitamin E supplement, selenium yeast, magnesium oxide, natural flavors, zinc oxide, manganous oxide, ferrous sulfate, vitamin B12 supplement, manganese sulfate, zinc sulfate, copper sulfate, vitamin A supplement, ethoxyquin (a preservative), vitamin D supplement, riboflavin supplement, calcium pantothenate, niacin supplement, ethylenediamine dihydriodide, cobalt carbonate, riboflavin supplement, niacin supplement, menadione sodium bisulfite complex(source of vitamin K activity), choline chloride, thiamine mononitrate, calcium pantothenate, folic acid, biotin, pyridoxine hydrochloride. Feed Witmer 20% Calf Starter R50 continuously at a rate of 0.56 to 4.0 pounds of grower per 100 pounds of body weight per day to supply 0.14 to 1.0 milligrams per pound of body weight up to 200 milligrams per head per day. One Witmer 20% Calf Starter R50 can be offered to calves up to six months of age being fed minimal forages. Keep fresh feed in front of calves at all times and remove fines frequently. Offer clean, fresh water frequently. Do not feed if product is moldy or suspect in any way. Do not allow horses or other equines access to formulations containing Monensin. Ingestion of Monensin by equines has been fatal. Monensin medicated cattle feed is safe for use in cattle only. Consumption by unapproved species may result in toxic reactions. Do not exceed the levels of Monensin recommended in the feeding directions, as reduced average daily gains may result. Feeding undiluted or mixing errors resulting in high concentrations of Monensin could be fatal to cattle. Must be thoroughly mixed in feeds before use; do not feed undiluted. If feed refusals containing Monensin are fed to other groups of cattle, the concentration of Monensin in the refusals and the amount of refusals fed should be taken into consideration to prevent Monensin overdosing. This product, which contains added copper, should not be fed to sheep or related species that have a low tolerance to copper. This product has been specifically formulated for dairy calves and is not intended for other species. A withdrawal time has not been established for pre-ruminating calves. Do not use in calves to be processed for veal. Grain products, plant protein products, processed grain by-products, calcium carbonate, molasses products, blended poultry and vegetable fat preserved with BHA, sodium bentonite, monocalcium phosphate, potassium chloride, magnesium sulfate, vitamin E supplement, d-biotin, ferrous sulfate, sodium chloride, manganese chloride, zinc chloride, copper chloride, vitamin A supplement, animal fat, selenium, ethylenediamine dihydriodide, cobalt carbonate, roughage products, propionic acid, acetic acid, ammonium hydroxide, vermiculite, calcium bentonite. Grain products, plant protein products, processed grain by-products, calcium carbonate, animal protein products, sodium bentonite, natural flavors, artificial flavors, salt, hydrolyzed yeast, cereals distillers dried solubles, hydrated sodium calcium aluminosilicate, fat product feed grade, saccharomyces cerevisiae yeast culture, dried enterococcus faecium fermentation product, dried lactobacillus acidophilus fermentation product, dried aspergillus niger fermentation extract, dried trichoderma longibrachiatum fermentation extract, dried bacillus subtilis fermentation extract, Vitamin E Supplement, Zinc chloride, roughage products, Manganese chloride, Copper chloride, Vitamin A Supplement, Vitamin D Supplement, mineral oil, d-Biotin, Cobalt Carbonate, ethylenediamine dihydriodide, dextrose, sucrose, calcium silicate, artificial flavor ingredients, propylene glycol, selenium yeast (Saccharomyces cerevisiae), sodium selenite, molasses products, montmorillonite clay, diatomaceous earth, propylene glycol., soybean oil, calcium propionate. Feed at a rate of 0.14 to 0.42 milligram per pound of body weight per day, depending on severity of challenge, up to 200 milligrams (Up to 13.79 pounds) per head per day on Monensin. During first 5 days of feeding, cattle should receive no more than 100 milligrams per day in not less than 1 pound of feed. A withdrawal time has not been established for preruminating calves. Do not use in calves to be processed for veal. Do not allow horses or other equines access to formulation containing Monensin. Ingestion of Monensin by equines has been fatal. Monensin medicated cattle and goat feed is safe for use in cattle and goats only. Feeding undiluted or mixing errors resulting in high concentrations of Monensin has been fatal to cattle and could be fatal to goats. Must be thoroughly mixed in feeds before use. Do not feed undiluted. Do not exceed the levels of Monensin recommended in the feeding directions as reduced average daily gains may result. If feed refusals containing Monensin are fed to other groups of cattle, the concentration of Monensin in the refusals and amount of refusals fed should be taken into consideration to prevent Monensin overdosing. For prevention and control of coccidiosis, feed at a rate of 0.14 to 0.42 milligram per pound of body weight per day, depending on severity of challenge, up to 200 milligrams per head per day. During first 5 days of feeding, cattle should receive no more than 100 milligrams per day in not less than 1 pound of feed. Grain products, plant protein products, processed grain by-products, calcium carbonate, animal protein products, sodium bentonite, natural flavors, artificial flavors, salt, hydrolyzed yeast, cereals distillers dried solubles, hydrated sodium calcium aluminosilicate, fat product feed grade, saccharomyces cerevisiae yeast culture, dried enterococcus faecium fermentation product, dried lactobacillus acidophilus fermentation product, dried aspergillus niger fermentation extract, dried trichoderma longibrachiatum fermentation extract, dried bacillus subtilis fermentation extract, Vitamin E Supplement, Zinc chloride, roughage products, Manganese chloride, Copper chloride, Vitamin A Supplement, Vitamin D Supplement, mineral oil, d-Biotin, Cobalt Carbonate, ethylenediamine dihydriodide, dextrose, sucrose, calcium silicate, artificial flavor ingredients, propylene glycol, selenium yeast (Saccharomyces cerevisiae), sodium selenite, molasses products, soybean oil, montmorillonite clay, diatomaceous earth, propylene glycol., calcium propionate, monocalcium phosphate, dicalcium phosphate, vitamin A acetate. Feed 3.33 lbs to 13.33 lbs to provide not less than 50 mg nor more than 200 mg of Monensin per head per day. Confined cattle (slaughter, stocker, feeder, and dairy and beef replacement heifers):for prevention and control of coccidiosis due to Eimeria bovis and E. zuernii..
Roughage products, grain products, plant protein products, montmorillonite clay, diatomaceous earth, molasses products, Fiber Pellet, calcium carbonate, monocalcium phosphate, dicalcium phosphate, salt, yeast culture, magnesium oxide, artificial flavors, dextrose, sucrose, calcium silicate, artificail flavor ingredients, propylene glycol, Vitamin E Supplement, Zinc chloride, Manganese chloride, Copper choride, Vitamin A Supplement, Vitamin D Supplement, mineral oil, d-Biotin, Cobalt Carbonate, ethylenediamine dihydriodide, selenium yeast (Saccharomyces cerevisiae), vitamin A acetate, processed grain by-products, sodium bentonite, magnesium sulfate, potassium sulfate, choline chloride, L-lysine, ferrous sulfate, zinc sulfate, zinc oxide, manganese sulfate, copper sulfate, manganese oxide, calcium iodate, vitamin B supplement, riboflavin, niacin supplement, calcium pantothenate, menadione dimethylprimidnol bisufite, follic acid, biotin, thiamine mononitrate, pyridoxine hydrochloride, dried aspergillus oryzae fermentation product, dried yeast fermentation solubles, organic selenium. Feed 3.7 lbs to 14.81 lbs to provide not less than 50 mg nor more than 200 mg of Monensin per head per day.